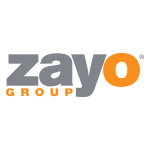 BOULDER, Colo.–(BUSINESS WIRE)–An internet services provider has selected Zayo Group Holdings, Inc.
between the customer’s offices and this data center. have been validated through independent audits. Zayo’s zColo portfolio includes 51 data centers in more than 30 markets. For more information on Zayo, please visit zayo.com. colocation and cloud infrastructure to the world’s leading businesses. This press release contains a number of forward-looking statements.